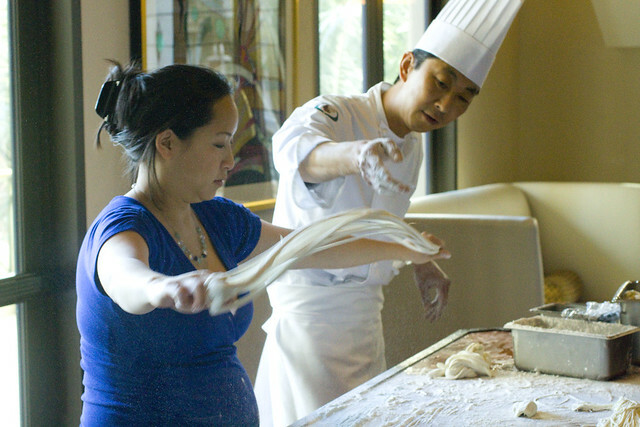 Our absolute favorite part of the Las Vegas Taste Tour was the noodle-making lesson with master Chef Li Yu, who started learning the art in his teens–about 27 years ago. He started with a demonstration where the ease of his movements show that for him, it is second nature by now. We, the bloggers, watch mesmerized as we prodded him with questions, none of which disturbed his rhythm one bit. When I say “we”, it was mostly me, because I have tried pulling noodles with my mom at home before and had queued up many questions. Plus he only spoke in Mandarin. My homemade noodles always taste good, but my process looks nothing like his seamless martial art motion that quickly creates several bowls of noodles. Then there’s also the shaved noodle technique where a block of dough is shaved into noodles by a sharp blade. It is another quick and deceivingly seamless process. I was dying to know all the secrets. In our video, I try to outline some key points we learned in the subtitles. We’ll be experimenting at home too, so there will be a follow up post….one day. We got to try our hand at the two techniques and soon realized how hard it really was. The shaved noodle dough feels a bit like Play Doh and it’s hard to get long strands vs. my short slug-like shapes. I think I managed a little bit better with the pulled noodles and covered my belly with flour. In the future I’ll see if we can re-create this at home. After the lesson we wrapped up our afternoon of noodles. We got to sit down at Beijing Noodle No. 9 3570 Las Vegas Blvd S, Las Vegas, NV 89109, where Chef Li Yu is the executive chef. The noodle dishes are the specialty here and really worth a trip to eat. Skip the dim sum (really not a Beijing thing) and get two bowls of noodles because you have to have both: the shaved noodles and the pulled. They both have amazing and different textures. You may not get to make the noodles, but you can watch their master craft in the front window. posted by jessica	at 03:45 PM	Filed under Asian, Chinese, Recipes, Restaurants, Video. You can follow any responses to this entry through the RSS 2.0 feed. Both comments and pings are currently closed. Awesome video! 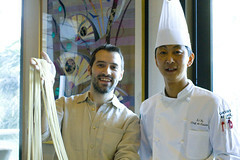 You are so lucky you got to film and learn from this master noodle-ologist. (used all my tiles on that word) It is such a pleasure to see someone so assured and comfortable with his materials as chef Li Y is. Reminds me a my wife describing how as a child she used to watch her Polish grandmother make noodles. Invite me over when you recreate this noodle event! 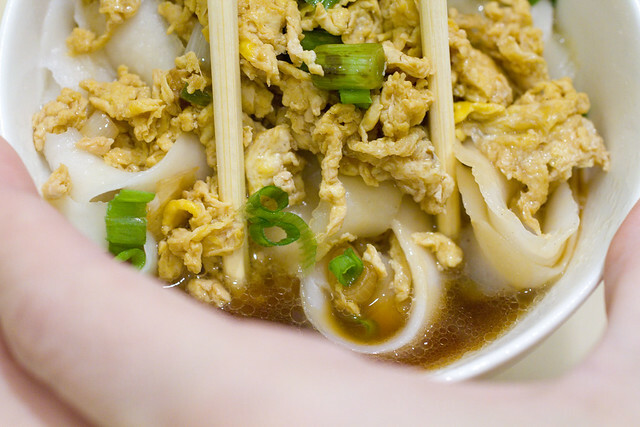 Have you ever eaten at Tasty Hand-Pulled Noodles, 1 Doyers St., NYC. It also features hand pulled and knife-cut noodles. We enjoyed it both times we visited. I love shaved/”cutting” noodles! It’s not as common here. Wow, look at your bowl: I can just imagine the chew! Awesome–your pulled noodles turned out great. That’s a real cool video! It looks really difficult but yours came out awesome! Marcos, I don’t think I’ve had Polish noodles before. Going to have to find some of that. Roxanne, I don’t think I’ve been to Tasty Hand-Pulled Noodles. We go for the pulled and shaved in Flushing Mall and Lan Zhou. I’ll have to try Tasty. Asianmommy, we plan on trying it at home. It may take us years to perfect but we’re determined. Thanks LimeCake! It’s harder than it looks. Awesome! Thanks for sharing and I think you guys look like you did great! 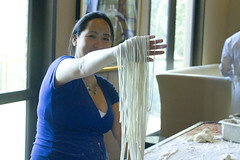 Can you send me the recipe for the hand shaved noodle dough? Also, what is it that you are shaving them with? Is it a sharpened bench scraper? Thanks! 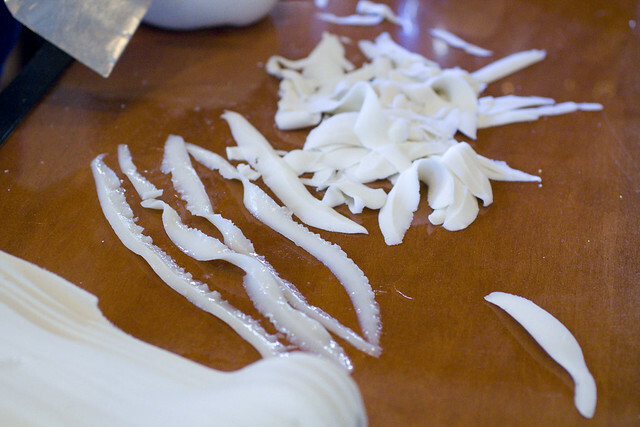 Wonderful article and video on noodle making. I’ve tried it a couple of times with improving results, but the mess is beyond belief. It is fun. Keep up the nice posts on SE’s Photograzing. Yang, they don’t use a recipe. They do it by feel, just high gluten flour, water, and a bit of lard (optional) for shine. It ends up feeling a bit like playdoh. The blade is one they brought back from China. They said they haven’t seen it in the US. I’m going to look around some Chinese sores next time. I’ll let you know if I find it. Square_pie, I imagine we’re going to make a mess since I was covered with flour by the time I did 5 minutes of noodle pulling. We’ll have to make sure my dog is kept away so she doesn’t end up coated.